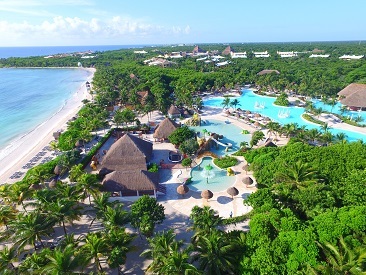 Grand Palladium Colonial Resort and Spa is an all-inclusive, family-friendly resort located in beautiful Riviera Maya. With Spanish colonial-style decor and the green surroundings reminiscent of an eco-resort, this hotel surrounds guests in beauty; coupled with the design of differing modern, spacious rooms, the surroundings and style of Grand Palladium Colonial label it as a hotel to be enjoyed by couples, families or friends. Guests who are staying in any of the Grand Palladium hotels in the complex have access to every facility and are connected via a free, internal train service; Grand Palladium Colonial Resort and Spa has several amenities, including an adult swimming pool, sports center, a main pool that is located close to the beach and several bars and restaurants. Those seeking a hotel with a host of facilities and options should look no further than Grand Palladium Colonial Resort and Spa! The Grand Palladium Colonial Resort and Spa is located in the Palladium Riviera Maya Complex in Akumal, between Playa del Carmen and Tulum. The hotel is located in the central part of the Complex, next to the extensive private beach, near the spa, and next to the multi-sport center. The Grand Palladium Colonial Resort and Spa combines colonial Spanish décor with a profound respect for nature, creating a relaxing experience for visitors of all ages and interests. 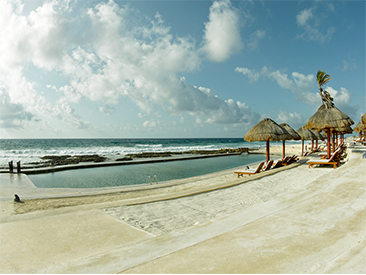 Explore the resort through the network of lush pathways, dive into the expansive pool or simply lay back on the beach. Here, your options for relaxation are never-ending. Guests have access to a full fitness center, spa, kids club, exhaustive dining options and so much more! The Grand Palladium Colonial Resort and Spa has a wide range of services for all types of travelers. As well as having access to all facilities available to guests staying in any of the Grand Palladium hotels in the complex — all of which are connected by a free, internal train service — guests who stay at the Palladium Colonial Resort and Spa have the adult swimming pool, the sports center, the main pool close to the beach, bars like the Hemingway (which include international premium beverages), close proximity to restaurants and so much more! Black & White Junior’s Club for teenagers (13-19 years old). Guests enjoy access to all services offered at the three Grand Palladium Resorts in the Mayan Riviera, except those located at TRS Yucatan Hotel. Recent Changes at Grand Palladium Colonial Resort and Spa! New room upgrades are underway, featuring new room decorations, new flat-screen TVs and a new room layout easily accessible to guests with disabilities! This pristine suite will be a beachfront bungalow complete with a private pool, sundeck, lounge, two bedrooms and Palladium’s upscale services. There are no promotions for this hotel at this time. Be sure to check back later! 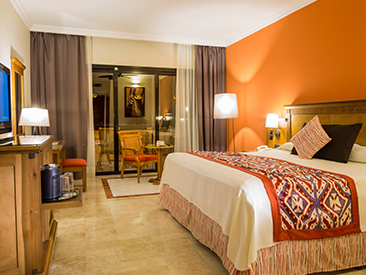 Please Note: Effective October 1, the Mexican government implemented a new environmental city fee to all guests staying at hotels in select Riviera Maya/Playa Del Carmen regions. The fee is $20 pesos per room per night beginning January 1, 2018 (about $1.10 USD per room per night). This new fee will be collected upon check-in from all guests.